The Cancer is versatile, affectionate, graceful and lovely! Physical equivalence: chest, breast, liver, kidney, endogenous fluid, circulation, lymphatic system, blood, and cerebral matter. Caused by the Moon cancer (sign ♋) is emotional. 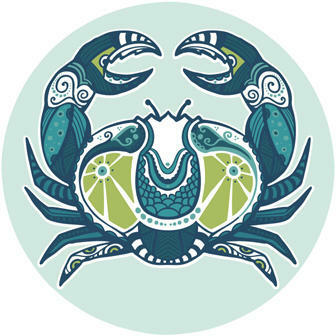 If the circumstances are changing, Cancers become more excitable, and in principle, they tend to behave impatiently. In particular lack of initiative causes to cling to the good and evil as well. Cancer persons can appear obstinate, and they hate to take on a subordinate role. Moreover, Cancers are more interested in the past. They believe in daydreams, impulsive acts, and presentiments – premonitions as well. They prefer to lead an extravagant life and expensive materials. More or less useful they perceive the outer aspects and value them. Their home is their imagination, and therefore it brings out real adventures. Occasionally they are suspicious and prudent. But after all, Cancers can give and to share the joy. They become soon reconciled. As fast as they become angry, often they can calm down soon. They appear in a smart, witty and diplomatic way. On the one hand they are like gypsies, and on the contrary, they desire an own place to rest – like a home with a family that they can treat well and take care for. They are soft with values of tolerance and good nature. They possess many talents and skills of perception and cognition – including philosophical ability. At first glance Cancer appears easy to handle: weak, soft and affectionate. But it is not the truth. They have real ambition, diligence, strong will. They just need a little support then they could work, manage and save - scarcely comparable ones. Versatile, affectionate, lovely, family, romantic, humorous, tolerant, graceful, beautiful. Unsettled, moody, changeable, sensitive, suspicious, melancholic, sentimental, unsteady, obstinate, weak.